Q IS the concept of clean and unclean animals a fundamentally Jewish teaching? A Long before He brought the Jewish nation into existence God classified the animals into categories of clean and unclean (see Gen. 7:1,2; 8:20). This distinction existed in Noah's day before there were different races or a Jewish nation. Most of the unclean animals are predators or scavengers whose bodies harbor diseases and toxic chemicals. Not only is the Bible clear that the flesh of swine and rodents is unfit for human consumption, modern medical science also extensively confirms this. It is not to rob us of pleasure, but to protect our health, that God warns us not to eat unclean animals. Q Didn't Peter receive a vision telling him that no animal is unclean? (Acts 10). A Quite simply this vision was God's symbolic representation of the way the Jews felt about the Gentiles. They saw them as common and unclean. Peter himself explained the meaning of the vision in verse Acts 10:28 "And he said unto them, Ye know how that it is an unlawful thing for a man that is a Jew to keep company, or come unto one of another nation; but God hath showed me that I should not call any man common or unclean." God's message to Peter was that they should not call the Gentiles unclean, and the gospel was to be proclaimed to all people. Not once did the apostles or early church apply this vision to the question of what foods may be eaten. Q Didn't Jesus say, "Not that which goeth into the mouth defileth a man; but that which cometh out of the mouth, this defileth a man." Matthew 15:11. and didn't Jesus declare all foods clean? (Mark 7:19). A The subject in these two passages (Matt. 15:1-20; Mark 7:1-23) is not diet or food. The Pharisees had made very strict laws regarding ceremonial cleanliness. They believed that you picked up sin by contact with Gentiles or anything they might have touched, and absorbed it when you ate with unwashed hands. Jesus was not giving license to eat unhealthful, but was rejecting the idea of ceremonial defilement by touching Gentiles. The expression "Purging all meats " in Mark 7:19 is merely Mark's restatement of what Jesus said and reiterates the point that you can't eat sin with your food; sin comes from within. It should also be noted that the word "meats" in the KJV is more correctly translated foods. Jesus did not consider unclean animals food. Q Why does the Bible say "Let no man therefore judge you in meat, or in drink, or in respect of an holyday, or of the new moon, or of the sabbath days." Colossians 2:16. Does this text free us to eat and drink anything we want? A Colossians 2:14-16 warns believers not to enforce the observance of ceremonial laws given to ancient Israel that pointed forward to Christ's death. These laws, pertaining primarily to the services in the sanctuary included meat and drink offerings and various holy days. Those offerings which typified different aspects of Christ's atoning sacrifice came to an end when Christ died on Calvary. (See Lev. 23:37; Heb. 9:9-12). But Jesus did not cancel moral, physical, social, governmental or health laws by His sacrifice. Rather, by His death He established the law and showed that it could not be changed. Jesus did not come to cleanse pigs; He came to cleanse sinners. If an animal was unhealthy because it was a scavenger before the cross, it is unhealthy now because it is still a scavenger. Q What did Paul mean, "I know, and am persuaded by the Lord Jesus, that there is nothing unclean of itself: but to him that esteemeth any thing to be unclean, to him it is unclean." Romans 14:14. A Paul is simply saying that a food that has been offered to an idol and is then sold at market bears no defilement for that reason. This does not deny that foods tainted with spoilage, disease, food poisoning, inferior ingredients or harmful chemicals are unfit to eat. The text does not disregard this reality. The issue here is whether it is wrong to eat meat offered to idols. The same issue is addressed in 1 Corinthians 8:1-13; 10:27-33. Q Does 1 Timothy 4:1-7 indicate that those who observe the Biblical distinction between clean and unclean meats have given heed to seducing spirits and doctrines of devils? A These persons command to abstain from, "meats, which God hath created to be received with thanksgiving." First, the word meats here is the Greek word which simply means food, so this is not a discussion of clean versus unclean meats. Second, the type of food is given: "Foods which God has created to be received." God did not create unclean animals to be consumed as food. Paul is simply warning against heresies that impose fasts and dietary restrictions on things God meant to be food. Perhaps the greatest misunderstanding has come from verse four where it is stated, "Every creature of God is good if it is received with thanksgiving." Some take this to mean that any creature is fit to eat if it is earnestly prayed over with thanksgiving. This would mean that giving thanks over maggots, cockroaches, rats, bats, vultures, and humans would make them acceptable for food. Fortunately, Paul added, "For it is sanctified by the word of God and prayer." 1 Timothy 4:5. The word of God must first approve it, then the prayer of thanksgiving will sanctify it to be eaten. It is not Paul's intent to denounce or censure those who choose a pure and simple diet. 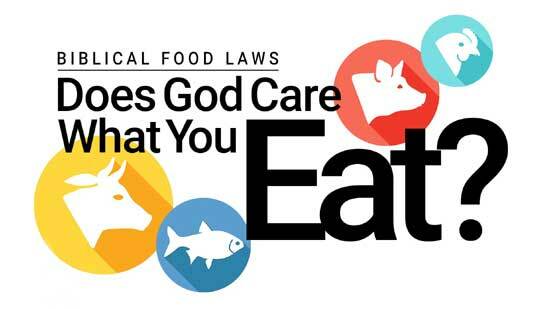 Certain animals are intrinsically unhealthy and God Himself commanded that they not be eaten. Q What did Paul mean when He instructed Timothy to take, "Drink no longer water, but use a little wine for thy stomach's sake and thine often infirmities." 1 Timothy 5:23. A There is nothing in Paul's counsel to Timothy which would indicate that this wine was fermented. Since alcoholic drink is categorically condemned in the rest of the Bible "Wine is a mocker, strong drink is raging: and whosoever is deceived thereby is not wise." Proverbs 20:1. "Who hath woe? who hath sorrow? who hath contentions? who hath babbling? who hath wounds without cause? who hath redness of eyes? They that tarry long at the wine; they that go to seek mixed wine." Proverbs 23:29,30. "And the LORD spake unto Aaron, saying, Do not drink wine nor strong drink, thou, nor thy sons with thee, when ye go into the tabernacle of the congregation, lest ye die: it shall be a statute for ever throughout your generations:" Leviticus 10:8,9. "Know ye not that the unrighteous shall not inherit the kingdom of God? Be not deceived: neither fornicators, nor idolaters, nor adulterers, nor effeminate, nor abusers of themselves with mankind, Nor thieves, nor covetous, nor drunkards, nor revilers, nor extortioners, shall inherit the kingdom of God." 1 Corinthians 6:9,10. It is inconceivable that the New Testament church leaders would condone it. Would the apostle Paul recommend a drink which is potentially addictive, diminishes spiritual sensitivity, and devastates lives and families? Certainly not! Paul is not advocating social drinking. He is recommending grape juice as a remedy for Timothy's delicate stomach and other infirmities.